World War II. Autumn of 1939. The Nazis occupied Poland and thousands of Jewish families escaped eastward, into the hands of the Russian army that exiled the refugees to the freezing weather, hunger and dreadful poverty of Siberia. After their liberation, many decide to go to south, to Samarqand in Uzbekistan where they hoped food was available. Despite the milder climate of these lands, life was difficult and many died from hunger and epidemics. Some Jewish parents preferred to give their children a better chance for survival, and left them in local Polish orphanages, posing as Christians. The parents made their children swear never to forget their Jewish faith, and promise to live as Jews as soon as they reach safety. Most of the Jewish families were not permitted to join Anders’ Army’s departure from Poland, but the Christian Polish orphanages were allowed to join the journey. The children were transported by cars and on trains to the port city of Krasnovodesk on the shores of the Caspian Sea, and from there, to Pahlevi in Persia. After a short stay in Pahlevi under extremely harsh conditions, the children were moved to Teheran and were crowded in tents, in horrendous sanitary conditions. When word of the children’s arrival in Teheran reached Palestine, the Jewish Agency sent three Israeli emissaries to care for them and to extract as many Jewish children from the Christian orphanages as possible. Several months later, in early January 1943, after intensive diplomatic efforts, the British authorities granted certificates to the children to enter Israel. 700 children and their escorts left Persia through the Karachi Sea to India, and from there, after several days of travel through the minefields of the Indian Ocean they reached Suez. On February 18, 1943, the train bearing the children from Teheran arrived in Gaza and continued from there to Rehovot and Atlit, where their arduous journey ended. 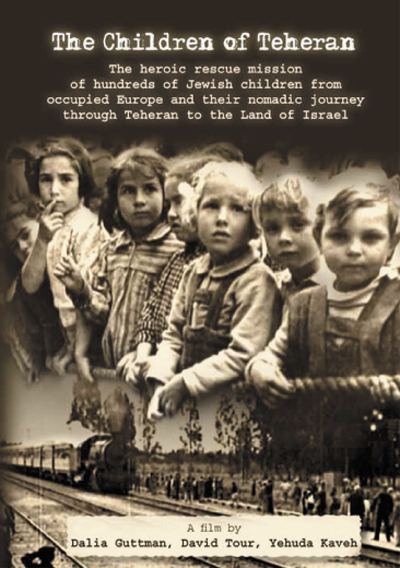 The Children of Teheran was first large group of Holocaust survivors to reach Palestine from occupied Europe. Youth Immigration activists, headed by Henrietta Szold and Hans Bate, welcomed the children at the camp established in Atlit. "The film is a most powerful film. You have been highly successful in combining together the components of the horrific historical facts and the individual first-hand authentic experiences into a richly woven tapestry. It conveys this saga with sophistication and taste. It is therefore both enlightening and heart-rending. The efforts you invested in this film are thus splendidly evident. I was deeply affected by the impact of the film, heart and mind." - Yael Medini, the daughter of Zippora and Moshe Sharett. In the winter of 1940-41 Zipporah Sharett was the Yishuv’s emissary to the camp of the Children of Teheran - as shown in this film. Moshe Sharett was the head of the Political Department of the Jewish Agency prior to the establishment of the State of Israel.